In England we lag well behind our European neighbours in our foreign language skills, with many adults too shy or lacking the skills to try even basic pleasantries such as please and thank you while abroad. One of the greatest gifts we can give to our kids is the opportunity to communicate effectively where ever they are, and the first stage of this is exposing your child to the idea at as early an age as possible that different people speak in a different way to your own family. If you already live in a bilingual home, this could mean playing songs from a third language for example. For the majority of us not blessed with diversity in our home languages, any other language is fair game for familiarising your children to other speech sounds. It has been shown through simple observational experiments that even very tiny babies will preferentially turn their head towards people speaking in the language of their parents. It has been hypothesised that this is because as infants in the womb we hear our parents pattern of language and learn to recognise it. I also found from my own observations that when Ollie was just learning to say a few words that he would focus more interestedly on children's shows in English than the ones in German which my friend kindly sent to me. It got me thinking that since language recognition and preference is present so early on, it was important to give children access to hearing other languages as early on in order to help them 'get their ear in' for any language learning they had available later on. I went to a private school for a couple of years from when I was seven and for this brief time I was fortunate enough to start to learn French. After returning to regular middle school, I then didn't learn any French until I went to secondary school at twelve. Even now, the French that I recall with greatest ease is that which I learnt at aged seven. Trying to learn it later on was so much harder that, although I got a B in my GCSE, I really lost a lot of confidence in the whole concept that I could be a fluent speaker of another language. I learned to pass an exam, not to be able to communicate with other human beings. 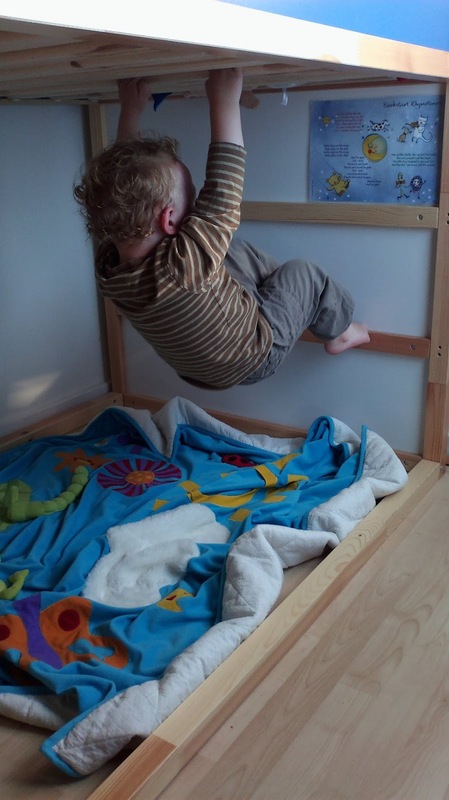 I would love my kids to pick up languages as naturally as they do everything else, before they start to think that there are things that they can't do. The general advice for parents is that, unless you are properly bilingual yourself, don't try to teach your kids languages. I can see the sense in this as a way of protecting children from pushy parents armed with flashcards and horrible pronunciation, but there must be a happy medium between inflicting cruel and unusual linguistic punishment and simply not trying at all. For us, we walk that line by attempting to pass on the bits we know, such as counting down the stairs in different languages - I do French and German, Matt does Spanish, we both count in English (usually in the voice of The Count from Sesame Street 'Von step, Ha Ha Ha...'). We have borrowed bilingual French/English books from our library, and have a few French and German books of our own (including Ollie's favourite book on Castles which we bought when my parents took us on holiday to France when Ollie was just 5 months old). 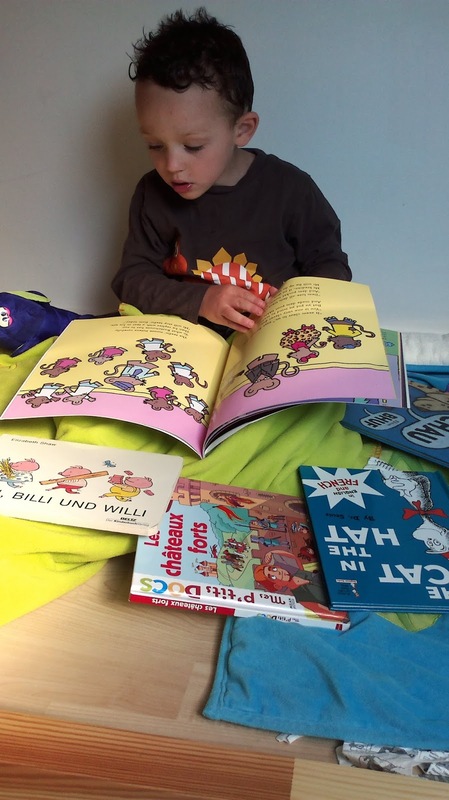 Another of his favourites is 'Zilli, Billi unt Willi' a three little pigs story in German. When we were preparing to visit Ben, Michelle and Isaac in France earlier this year (see the post 'We built a polytunnel in France') we got Ollie and Isaac each a bilingual 'The Cat in the Hat'. I have been astonished at how patiently Ollie listens to first the French and then the English version of each paragraph. 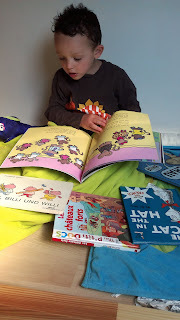 Before we went I got out a couple of bilingual books from the library, and Ollie loved one 'Depeche-toi Molly' by Lone Morton and Gill Scriven so much that he insisted we renewed it for months. I would introduce a few things he could say when we got to France, and Ollie would reply 'not now mummy, I'll talk French when we're at France' (he was three years and four months old at the time). He wasn't kidding. Playing with French kids in play parks on the journey, and talking to locals in shops, sure enough he rolled out his couple of French phrases 'hello', 'goodbye', 'please', 'thank you' and 'sweeties please' which got him lots of amused smiles (I won't insult you with my French spelling of these). Funniest of all was when he was chatting away in a nonsense language out of the window of our friend's house, and when asked what he was doing he said 'talking French to the cars on the road'. So although we may not be gifted linguists ourselves, I'm happy that the kids will at least grow up confident that they can be. So what has this all got to do with Rastamouse? We were sent this fantastically bright and fun book to review by Macmillan Children's Books this week, and as I was at first stumbling over and then having fun with the Jamaican dialect it is written in, it struck me that learning to understand dialect is just as important in Britain as learning any other language. We have an incredibly rich heritage of spoken dialects in Britain, with strong accents and even different use of words across the country, from the heavily Gaelic and Norse influenced dialects of the North to the lilt of Wales and the burr of the West country. We also have greater population mobility than ever before, leading to the high likelihood that we will hear accents and dialects of English from not just a few counties away, but from whole different continents. My favourite doctor at my GP surgery is an Indian from Birmingham, with a broad brummy accent that I find very comforting since I spent some of my teenage years down the road from Birmingham in Malvern. Having taught students who complained to me that they couldn't understand the accent of another teacher who was Indian, but who I found to be perfectly comprehensible, I started to realise that even in multicultural Britain many of our kids are surprisingly limited in their ability to understand accents. This is solely through lack of contact - anyone from the South of England talking to a Glaswegian with a strong accent for example will rapidly begin to understand more and more as they go on. Just as we can expose our children to foreign languages, we can also make sure they start getting familiar with foreign accents and dialects. 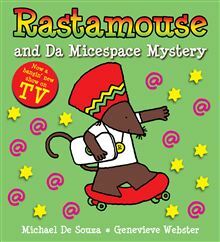 Books and TV shows such as Rastamouse are a really useful tool in this broadening of children's horizons, as well as providing representation in the media to children who come from backgrounds that use this dialect at home and who may otherwise feel left out. the authors also introduce other interesting concepts which small children are perhaps increasingly exposed to, such as the importance of internet security. We didn't even have the internet when I was Ollie's age, so it tickles me to be explaining the concept of internet banking theft to my three year old. Some of the dialect needed explaining- one of the mice said 'check out my bad boy moves' referring to his tricks with his skateboard, but this left Ollie searching for where the 'bad boy' was and worried what the 'bad boy' was going to do (he has a strange thing at the moment for checking I've locked the door when we go out in case a 'bad boy comes and steals our fruit' !?). Both kids like this book though - the artwork is so eye catching that they have regularly picked it out in the couple of days that we've had it. I think Ollie will increasingly start to follow the story as he gets used to the language and the new concepts. It's interesting trialling resources based on TV shows with the boys since they are less exposed to TV, films and computers than most kids their age. It means you can see if a book works as a stand alone product, or only appeals because it is about a beloved TV character. We have a Bob the Builder book for example from when Ollie was younger which is thoroughly worn from being read so many times, despite the fact that he had never seen the TV show. I think that the way the authors of Rastamouse have presented this story as rhyming couplets rather than just a TV script bodes well for it's surviving the initial interest in anything new, and it becoming a regular favourite in our house. Our thanks to Macmillan Children's books for this book to review. The opinions, musing and pictures of cheeky boys are all my own.